Nancy sent this one and I have not stopped laughing since it arrived! 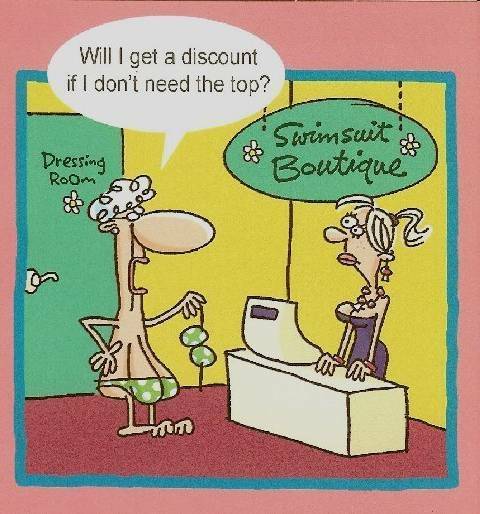 This entry was posted in humour on November 19, 2009 by Grannymar. Grannymar love this post today— just think how much I would save! Steph – It does indeed. Maynard – I am sure Nancy looks well in polka dots. She is in your neck of the woods, so watch for her at the Mall! Maybe you even know each other already! Gail – The thought of you in Polka dots……. I need to sit down fast! Oh My Gosh, this one was very funny. It took me a moment to get it, probably shouldn’t admit that but it’s 4:30am, then the little light came on. I must send it on to My Da. He’ll get a laugh out of it as well. You may be laughing now but that smile will go away very quickly when you get the letter from my lawyer telling you that I am suing you for using that picture of me in my bikini without my permission. And, watch your step,Nick, or you’ll be hearing from him,too! Is it just a Kini if your only wearing half of it? Brighid – What the He** are you doing up at 4.30am? And yes it is a kini! Magpie – Monkeyni – that is a new one on me! Nancy, it may have been invasion of privacy but highlighting this shocking state of affairs was clearly in the public interest. Oh, my, that is funny! I’m still chuckling. Nancy, Grannymar says that we may live close to each. Was that you I saw in the YWCA pool today trying to tuck everything back into your swimming suit after you jumped off of the diving board? That person should have bought both pieces and not taken the discount! Grannymar, what are you trying to say about me? That my rear is to “big”! Gail, stop fishing for compliments. Betty – I am still laughing since yesterday. Maynard – Nancy is the belle of the pool Aerobics! Gail – I am unable to see around to the rear for that answer! Actually, Maynard, what happened when I jumped into the pool at the Y was, that I was trying to tuck them back in after my plunge but was not successful so had to hold them cradled in my hands till I could stuff them in the bottom of my bikini.